Pan-fried foie gras served with a compote of caramelised pears, onion and honey with white balsamic vinegar. Peel the pears, cut into quarters and remove the core. Peel and finely dice the onion. Heat a saucepan to hot, add the honey and the pears, cook for 2 minutes before adding the onion and the grenadine. Cook for 10 minutes and then deglaze the pears with the white balsamic vinegar. Heat a frying pan to very hot and then add the foie gras slices and cook for 10 seconds. Turn the foie gras over and remove from the heat. Leave in the pan and allow to cook for 3 minutes. Season with fleur de sel and pepper. 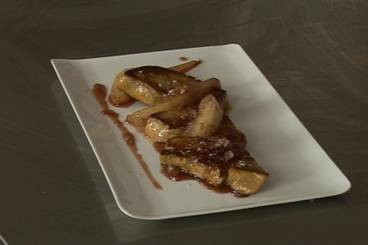 Serve the foie gras with the caramelised pears.